Last.fm – the Blog · Did Someone Say On Demand? Did Someone Say On Demand? We’ve always strived to make Last.fm as relevant to your music life as possible. Whatever you’re listening to and wherever you’re listening to it from – we know about it. There has however been one gap; the inability to play whatever you want by whoever you want directly on Last.fm. This has now changed. We’ve teamed up with Spotify to bring their entire catalogue, on demand, to the world’s leading music recommendation service. Whether it be your own profile page, artist pages or album pages – if Spotify has it, you can play it and control it on Last.fm via the Spotify playbar at the bottom of the screen. Using your Spotify account (premium or free) you can listen to any track simply by pressing the play button. This will load all tracks on a Last.fm page as a playlist in Spotify. 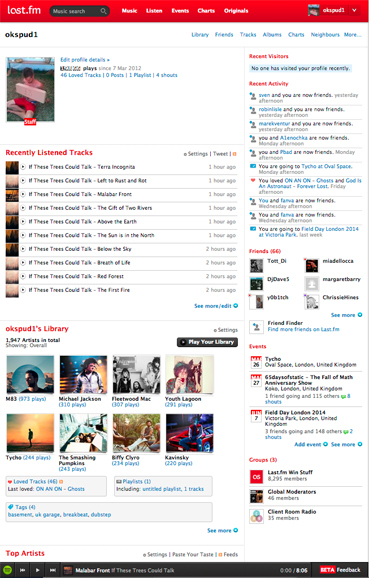 This new feature brings a depth to Last.fm like never before and gives you a much richer listening experience. The availability of over 20 million tracks at your fingertips allows you to listen to full albums as well as rediscover your scrobbling history – listen to your loved tracks, past charts and more. This latest collaboration builds on an already successful partnership between the two services, which includes the highly successful Last.fm app on Spotify. We’re hugely excited to bring this new functionality to Last.fm and can’t wait to see what you think. This is awesome. Plainly awesome. Should be “bear with us” in the second-to-last paragraph. Aha! The Spotify integration activates when you click play on a track. Awesome! Love! Love! Thanks for the work you’ve put into this feature to bring it to us. Great news. I seeing the Spotify playbar, progress bar is moving, but I can’t hear music. I have no problems with Last.fm radio..
can you please also team up with bandcamp to serve DIY content? That would be awesome! I refuse to use Spotify. I dislike this feature! Does it work for tablets? Now is easy to listen to recommended artists. This is great news, but Spotify is not available in Russia and many other countries. Maybe you could team up with other services, for example Yandex.Music in Russia? Is there any MusicBrainz magic going on in the background to help correctly match the tracks betweeen last.fm and Spotify?? Finally some innovation again. Great feature! Since Spotify is not available in my region, this really has no use for me. However, it looks rather nice for those that can get it. It would be awesome if there was some similar feature for Beats Music. When is this going to actually happen? You need to make sure that the correct album is played through Spotify. Too often it reverts to Best Ofs, Live-Albums and other nonsense like that. Sounds mighty fine. Strangely can’t see any mention of your new beta “youtube” radio on this blog?? Is there any chance we can get it so that while I listen to my Spotify premium it can pull over my Last.fm library playlist? It would help when trying to find random music that I might have been into a year or two ago but might have forgotten about? I love both Spotify and Last.fm so this is great news! How is this supposed to work? I have a Spotify account but when I press a ‘play with Spotify’ arrow on LastFM nothing happens. Will it be possible to play Spotify Albums directly from a SONOS system now without the need to buy an additional spotify subscription? I didn’t see anything on the web page. No toolbar with Firefox 26.0 and adobe etc. in Germany. Is a membership at spotify necessary that the new feature works? Great idea. Too bad Spotify is only available in the US. Is there anything special to do to get it ? I’ve been a member since 2006 here…and I think it’s time for me to move on…I’m sure you’re alienating over half your user base by enforcing this stupidity since Spotify is not available in all regions as well. Smooth move Last.fm. You’ve just pissed on my 8 year membership. BTW, it’s working flawlessly for me so far – no bugs, no issues, just music… awesome. We don’t have spotify in Canada, and I can’t reach your main website today (the page just won’t load). Does this mean paid users outside of the US won’t be able to listen to radio anymore? This is fantastic news! But whatever you did in the update broke something – I can’t access the site in Firefox anymore. Whenever I visit it just tries to download “application/octet-stream”. No idea how to fix that. At long last, there is finally some movement in the right direction. Now, please let me stream radio and recommendations through Spotify as well. Then, reenable all the DIY/independent/directly licensed stuff you used to have and I’ll start subscribing again. Your recommendations are still far better than what I get using the Spotify “create radio station” which seems to only play old, boring, megahits. Great thing! If you team up with services like Soundcloud and Bandcamp as well, that would be even greater. Yeah, I am not pleased by this either. Spotify is one of the absolute worst programs in terms of compensating artists and I dislike being coerced into creating yet another account to use a service I was previously content with. Seriously people, read. Read and use your brains. 1) Nobody is required to register a Spotify account to use his Last.fm account. 2) Creating a Spotify account is free now (at least in multiple countries). 4) Stop biyatching. Thank you. A lot of the time, I just want a 30 second preview when I’m looking around and discovering new artists. I don’t want to have to wait for a program to be forced open. It’s a nice idea, though. Ok, I’ve got it. Now, with my new spotify account I like the new feature. It’s much better than the old preview (and nearly as good as the old old solution) Thank you for that. what ist last fm now good for? As a last fm fan I know, this isn’t a popular question. But on the first view the spotify radio much a better impression. On spotify you can play exactly every album, every artist, every track you want – nothing else. Ok the advertising bothers. But the radio has more opportunities. At Last FM you pay 3 Euro, at Spotify 10 Euro for the full monty without adds. I hope this evolution won’t cut the ground from under your feet. 1. nobody knows wether Spotify will survive with their economic data. But last fm won’t survive too with their visiter frequence (Google trends)So, where is the choice? 2. 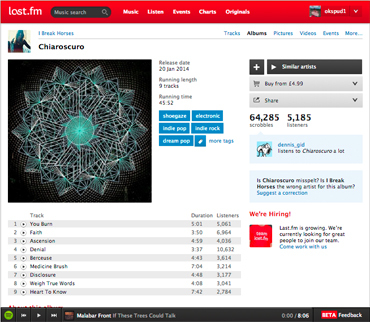 The community on last fm is much better (and bigger, I guess) Also the recommendations and the artist informations. The advent of Twitter has brought with it a highly valuable tool for online marketing. Twitter also helps to a great extent in brand recognition, search engine ranking and in building a strong customer base. It plays a great role in these tasks because it’s one of the most popular social media presently used by millions of people from all corners of the world. Really great idea, however, it does not work at all. I have no clue how to make this work (spotify premium + registered lastfm user). How do we get it? Spotify doesn’t work in Canada. rdio works. They have both done a terrible job explaining how to actually get this working. I’m a streaming radio fanatic and have spent 20 minutes trying to find the answer to the simple question of – how to get this to actually work. HOW do you link the accounts? Yes, I have premium Spotify, I even have the Last.FM app on Spotify. And copying stuff from a bunch of threads on support forums isn’t what I’m looking for. They need to provide clear and understandable instructions on their UI or no one is going to use, or care about this. This will be a sweet addition< I’m already liking it.